Every time you use your cell phone, you leave behind a few bits of information. The phone pings the nearest cell-phone towers, revealing its location. Your service provider records the duration of your call and the number dialed. Within the next few years, Pentland predicts, reality mining will become more common, thanks in part to the proliferation and increasing sophistication of cell phones. Many handheld devices now have the processing power of low-end desktop computers, and they can also collect more varied data, thanks to devices such as GPS chips that track location. And researchers such as Pentland are getting better at making sense of all that information. 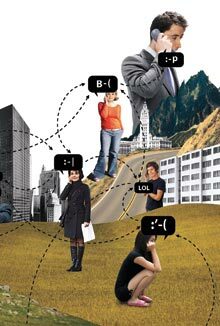 To create an accurate model of a person’s social network, for example, Pentland’s team combines a phone’s call logs with information about its proximity to other people’s devices, which is continuously collected by Bluetooth sensors. With the help of factor analysis, a statistical technique commonly used in the social sciences to explain correlations among multiple variables, the team identifies patterns in the data and translates them into maps of social relationships. Such maps could be used, for instance, to accurately categorize the people in your address book as friends, family members, acquaintances, or coworkers. In turn, this information could be used to automatically establish privacy settings–for instance, allowing only your family to view your schedule. With location data added in, the phone could predict when you would be near someone in your network. In a paper published last May, ­Pentland and his group showed that cell-phone data enabled them to accurately model the social networks of about 100 MIT students and professors. They could also precisely predict where subjects would meet with members of their networks on any given day of the week. Jeff Lichtman hopes to elucidate brain development and disease with new technologies that illuminate the web of neural circuits. "could predict where they would meet on any given day" Wow. I really feel great about my daughters going off to college now. Mix in cheap gps phone and tracking software and you know where the car is all the time and when they have not gotten a call in a while. Who really benefits from knowing these things? Obviously limits would have to be put in placed on this type of technology. I agree privacy is a real issue hear and we should be careful in using this tech. However I feel that it could be highly beneficial for people. I guess you could think of it as a more advanced Facebook. I'd be willing to bet that our Government, in particular its "security" services, will place no limits whatsoever on its use of such techniques. This adds weight to the argument that it is the duty of individuals everywhere to use every artifice to deliberately thwart such methods as a matter of routine. Would technology of this nature not ultimately lead to the *total predictability* of every cell phone user within the global cellular network? Is this not an extreme form of *personality profiling*? If one can predict an individual's behavior, could one then not introduce variables to alter such predicted behavior? Hence, would it not be possible to introduce controls over each of the individuals within the global cellular network? Over time, would it not be possible to develop an acceptable profile for a each given role within society? Therefore, couldn't acts deemed to be outside acceptable limits of the individual's given role (i.e politically incorrect) create negative repercussions for the individual who performed the act? In other words, could this not lead to an extremely granular system of "sticks" and "carrots?" How difficult then would it be to extend these limitations to entire populations and/or societies, as once the algorithms are created it is simply data collection and processing horsepower? So, given the above, I'd like to ask those at MIT, who are implementing this project, if they have asked the funders of this project what their long term plans are for this technology. Who is asking the moral questions? Who is making these long term societal choices? I remember reading in one of Dr. Stephen Baxter's works, about how around 2040, Weather forcasting, started to get extremely accurate, by incorporating weather sensors into new TVs. That in turn sent back basic weather data for that particular location. Thereby giving NOAA (for example) more and more data. I was wondering a) would that really work (I've read that one of the biggest problems with forecasting, is there's not enough sensors and data) and b) could you do the same with cell phones? GPS, is in a lot of phones now. That with real-time basic weather data, and a simple date/time code also added to the data packet. Just an idea. Good magazine, BTW. Is this really a box that they want to open? Do you really think that this will not be abused? How are you going to keep the Chinese government or the Iranian government from requiring that all phones sold in the country have this technology, so that they can keep tabs on there people. Obviously you cannot hold back technology indefinitely, but I would not want all that blood on my hands. Two thirds of the world’s population still lives in tyranny. Few people have thought about how this should be regulated in real life yet. It was nonexistent until now. The same occurs with any new technology. First it is created. Then it is regulated. Generally regulations only pop up to solve problems or perceived problems. The moment this technology becomes widely implemented, there are groups already in place likely to challenge it on grounds of privacy concerns. There are two main options for the regular person opposed to new technologies, help one of the groups opposing it or just opt out of using it yourself. mmmm, i completely disagree with the everyday personal life applications suggested that this kind of technology can have. what striked me was the phrase: "basically, to help you live your life". very dangerous idea. if someone need this stuff to "live his life" than he is dead already. maybe i sound harsh but some kind of effort that we have to put in our life is very useful and this efforts made possible for the human brain to evolve or at least not to atrophy. if you help the chrysalis to break out from the wrap you think you're doing right and helping but what you're actually doing is condemning the chrysalis to never fly. i like technology(that's why i'm reading this)but when rightly and wisely applied. what we see lately is just technology development with the basic and perhaps the only incentive being the economic revenues. this article reminded me the great book of Orwell "1984".